What if a drop-out of the university becomes necessary? Is vocational education really a possible alternative for me in terms of immigration law? And what about career chances, further educational opportunities and financial and non-financial support? After a few fair-trade drinks and snacks and some little discussions among the participants, Martin Nötzel of the KED (Kirchlicher Entwicklungsdienst der ev.-luth. Landeskirchen in Braunschweig und Hannovers – The Development Service of the Protestant Regional Churches of Brunswick and Hanover) welcomed everybody by introducing the representatives and the subject. As a starting point he said that in Germany the drop-out rate of international students, which is up to 46% in bachelor’s and 29% in master’s programmes, is still significantly higher than that of educational nationals. Nötzel reported that although an exact scientific explanation is still missing, he found a common sense among other student counsellors as well as international students that financial needs, difficulties in everyday life and a lack of social contact with other students and lecturers are the most problematic challenges international students have to face. But besides all those performance problems that may lead to a drop-out, there are also good reasons to make a change happen, just like to manage financial issues on your own or simply the interest to learn something more practical. After handing over to Ms. Heike Ganselweit, a lecturer at Werner von Siemens Schule in Hildesheim, who gave an overview of the German vocational education system with its generally 3 days of training in company and 2 days in school, we heard even more good news and advantages you have, if dropping of university and getting into a similar vocation to your study field. 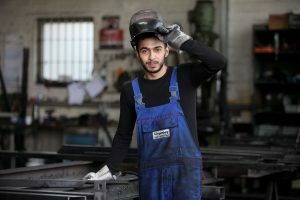 Among them is the chance to reduce school time within the whole vocational training for one year, to start alongside with the training for a technician, that the technician certificate has the same merit like a Bachelor degree and that many employers support the dual study system to go on studying on the job. Yes, you can change. As well in schooling (§16b Abs. 2 AufenthG), this is without a company, as in vocational education (§17 AufenthG) which is the combination of school and training in a company. Both are possible if the education is qualified as such and if it trains you in a so called “Mangelberuf”, a shortage occupation. If it’s not a shortage occupation, but a qualified education, you can claim an acceptance for the time of your education. After finishing, your residence permit will be extended for 6 month to find a job or start another kind of education. Since 01. August 2017, you don’t need to leave the country first to change your residence permit. And the most important question to answer was: do I have to assure the same amount of money as before as a student? No, if you earn enough in the first and second year of your vocational education. Working alongside is generally not allowed. If you chose schooling you’re allowed to work for 10 hours a week. This is in general. For more detailed information don’t hesitate to contact your foreign-department. By the way, Rodriguez emphasised that it is essential to get in contact with the foreign-department by time. Commonly at least 3 month in the run up to the date you want to start your new education. So don’t be square, be there! To plan your next steps with enough time beforehand, said Ms Bettina Ladwig from the department of business development in Region Hannover, is also needed to prepare effective application documents. As an ex-student you easily can be at an advantage to other candidates. Nevertheless, you have to give good reason, not so much to answer why you dropped out, but to what was your motivation to apply for this company and not another. In short, you have to identify and present your strength and the benefits you give within your new occupation. With her contacts to companies in the region and thereby knowledge about what companies’ needs really are when they’re looking for new applicants, Ms. Ladwig supports your preparation and bridges with her project called “Umsteigen statt aussteigen” (Change instead of getting off) since 2015 the gap between applicants and employers successfully. Essential to all of us on this Thursday afternoon was the contribution of Mrs. Mohammad Abdeljawad. 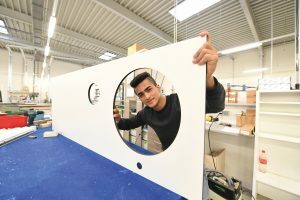 He shared his moving biography with us since he came here to Germany in 2005 to start his studies in electric engineering and informatics after preparatory colleges as most of international students do. And also as most of international students do, he had to face several problems to renew his residence permit for the purpose of studying. So it was a lot of fussing and fighting until he found a company in Hanover that works in the field he studied before and decided to hire him, because his residence permit in that was only extended for 3 month by a probationary visa. Law and order was relatively strict these days and you couldn’t find such a numerous range of services to get information about viable alternatives to make your way in Germany, Abdeljawad told us. Now he’s glad about the opportunity to abbreviate his vocational education and to finish it next year. We’re also glad to know that he made his way and curios about to hear from him soon. Sick pay: Protected in any event Health courses: How to manage stress Prescriptions, hospitalisation, etc. : how much do I have to pay, and what will the health insurance fund pay?